The University of Mississipi, better known as Ole Miss, retired its previous mascot Colonel Reb a few years ago. The school has put it up to the student body to select the next standard bearer of athletic pride. Looks like Ole Miss is going to replace a colonel with an admiral. Namely, Admiral Ackbar from the Star Wars movies. Ackbar has emerged as the front-runner among the possible candidates for the mascot job. "It's a trap!"? No, and it's not a joke either. Assuming the lawyers at Lucasfilm (who I have a more than cursory knowledge about, and that's as much as I dare say about that) lets Ole Miss do it, the Mon Calamari tactical genius who orchestrated the assault on the second Death Star could very well be leading the cheers at the football and basketball games! 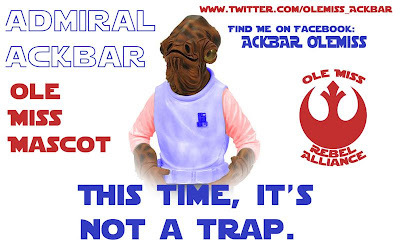 I like what one person has said about Admiral Ackbar at Ole Miss: "Well it does rebrand the Confederate cause in far more positive way -- I say they run with it. In fact, Ackbar's leadership as a symbol of the diversity of the Rebel Alliance against the human supremacist Empire reverses the whole image problem! Remember, the Rebel Alliance was fighting Palpatine's 'Grand Army of the Republic.'" Yeah, I guess that's one way of looking at it. But still, even being a die-hard Star Wars geek (and proud of it! 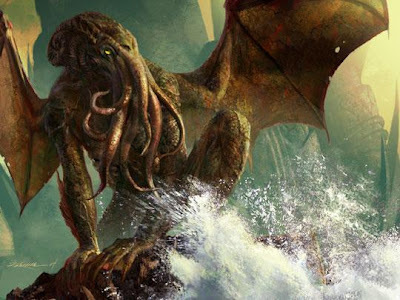 ), if I were at Ole Miss and had some say in who the new sports mascot should be, and if it had to be an aquatic alien, I wouldn't have considered Admiral Ackbar at all (no offense Acky). Can you imagine the sheer terror that would be evoked by such a thing? And hey, Ole Miss could rename their team to be the "Ole Miss Old Ones"!! "Our offense will create a perimeter around LSU while the quarterback flies into the superstructure and attempt to knock out the main reactor."